As a golf industry professional with pro shop experience at five different Midwest golf courses, I’ve experienced firsthand what is necessary to run a profitable golf course. As a grounds crew member at two courses, I assisted with daily mowing and maintenance tasks, including changing and cutting cups. I’ve also helped run dozens of golf tournaments and have played in hundreds of tournaments over the past decade, providing me with insight into golf course event planning. These experiences have allowed me to develop an expertise when it comes to researching and offering quality golf course products for the customers of Golf Griffin. Most of all, I have a passion for golf, and that has translated into my work at Golf Griffin. I played Division I golf for the University of Northern Iowa and have maintained a +1.7 handicap over the last five years, including shooting a low round of 59. In 2015, I also placed second among amateurs at the Waterloo Open in Waterloo, Iowa. 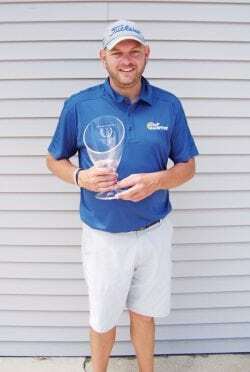 In June of 2018 I became the Fort Dodge Amateur champion. This means that when you work with Golf Griffin, you’re working with a dedicated industry expert who enjoys golf as much as you do. I invite you to explore our site to learn more about the quality products and easy deliver options that Golf Griffin offers. Thank you for visiting GolfGriffin.com—we look forward to serving you!